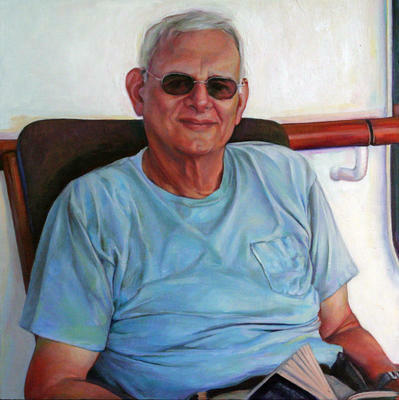 When I paint someone's portrait, I want to take that person's measure, and look for those signs that reveal personality. The shape of the head, the nose, the curl of the lips, the eyes, the hairdo, the wrinkles, the gesture of the hands and feet, the clothing—these are all clues to both our individuality and our common humanity. Looking at our mutual signage, those veils and layers that obscure or illuminate our personalities, and examining the way these layers of mystery create who we appear to be is what makes painting portraits so much fun. In this portfolio I've included a selection of my commissioned paintings as well as paintings of family and friends. If you'd like to commission a portrait, please contact me. Testimonials and more information about the process can be found on the "Commissions" page of this website.